This week some 50 people joined us in exploring how older people, or indeed anyone, might be encouraged to engage with digital technology and the Internet – without a screen in sight. Instead we used bits of card, flip charts and a lot of animated conversation. The aim was to start conversations around the research we carried out for Nominet Trust last year into technology in later life, and hopefully spark ideas for ways forward. 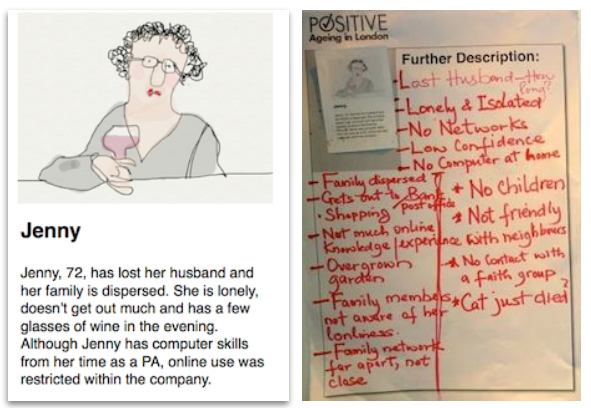 Drew Mackie and I ran the workshop, that I wrote about earlier, as part of the launch event for the Wealth of the Web report from Positive Ageing in London (PAIL) and Age UK London. I think people enjoyed themselves, and we gained some useful human insights to add to those in the broader scoping report written by Ben Donovan. The challenge for the session was how to offer people online opportunities, digital devices and support when everyone’s interests are different. The Government wants more people online for their own benefit, and to digitise public services, but one size doesn’t fit all. So Drew used his iPad mini to create some wonderful cartoons of Alice, Jenny, Faisal, Eunice, Sam and other characters who we introduced to groups in our workshop. Their first task was to fill out our starter description of their character, identify the main life challenges and opportunities that they faced. We then offered the groups a deck of 18 cards with some online activities that might help. 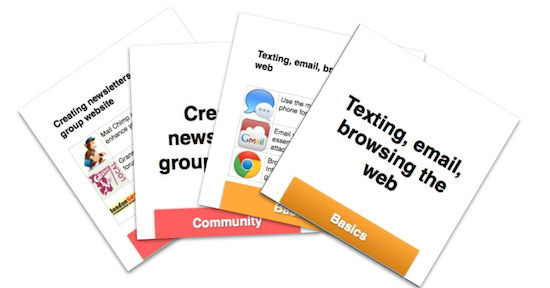 Each of the cards had a brief description of a possible activity, and then on the back we gave two or three examples of web sites or tablet apps that could be useful. Some of the cards we offered to groups. You can see all of them here. We asked the groups to describe what devices their character used at present, what key challenges and opportunities they faced, and to choose three or four of the cards. After that we asked how the life of their character might be changed if they adopted the ideas on the cards, and then to consider which device might be most appropriate – desktop or laptop computer, tablet, smartphone, smart TV or games console – and what sort of support might be useful. Would they, for example, benefit from access and training at the local library or online centre, if that were available, or get the help and encouragement they needed from friends and family? Groups identified challenges and opportunities, possible online activities, and then described the difference they might make. People may be fearful, with some justification, of the risk of going online. Can you trust sites with personal information? Guidance and support on that is essential. The process and costs of getting personal access are confusing. It is difficult to compare different home broadband and mobile broadband offerings, and monitor usage. Even those with computer skills may find upgrading to a new machine problematic, because much will have changed. Tablets like the iPad and Tesco Hudl are increasingly attractive because they are more intuitive to use, and the apps provide a quick route into useful activities. Organisations offering access and support may find it difficult to keep up with the move to tablets. Help is just as likely to come to come from friends and family. At the same time, libraries and centres are enormously important for social learning and support. 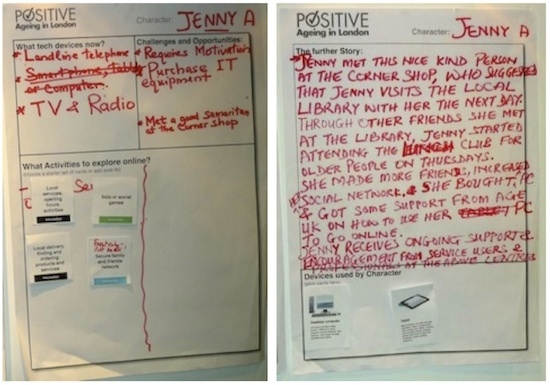 “Techy tea parties” run by Age UK London with corporate sponsors, and their Micommunity intergenerational learning programme have been very successful. Overall I believe that the key message was that all digital adoption is personal. Whatever the broad policies and programmes in place, everyone is different. One size doesn’t fit all. It’s not just a choice between laptop or tablet, smartphone or smart TV. It’s about what apps may be useful, and how to move from one to the other. It’s about how to develop the digital literacies to live in an increasingly technology-dominated world. Drew and I are really grateful to PAIL and Age UK London for the opportunity to try out the game, and to everyone who took part. The game is part of a proposal to Nominet Trust for a Living Lab of games and online resources for the Life Transitions challenge. I’ll be writing more later about that, and other possibilities for taking forward the momentum we achieved at the workshop. If you are interested in applying the game to your work, do get in touch. Meanwhile TalkLondon, the discussion forum for the Greater London Authority, have an item on the event which we’ll be expanding. Any comments welcome below too. Posted on January 29, 2014 by david wilcox. This entry was posted in All posts, games and tagged age uk london, digital inclusion, dtlater, games. Bookmark the permalink.